If you are renting fully serviced office space, then janitorial services should be included in the price. For companies who rent or own offices without an all inclusive cleaning service, you will need to arrange this yourselves with an outside commercial cleaning company. Depending on the size of your company, you will need to decide if you need a daily, weekly or monthly service. It is important to use a reputable office cleaning service, who are licensed and insured. Decide when you want your offices cleaned, in the evenings, mornings or weekends, whichever suits you best. You may want to have the general day to day cleaning done in the evenings, such as sweeping, vacuuming or waste paper bin emptying. You could organise a cleaning schedule for the bigger jobs to get done once or twice a month such as floor waxing, carpet cleaning and window cleaning. There are many commercial contract cleaning companies to chose from, offering a range of janitorial services to suit your exact needs. Get quotes from a few and compare to make sure you get the most out of the services offered. 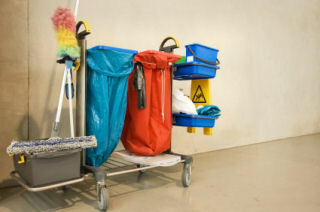 San Jose Janitorial Services – Complete cleaning service company serving the San Jose & Bay Area. This entry was posted on Tuesday, January 13th, 2009 at 4:35 pm	and is filed under Office Organization. You can follow any responses to this entry through the RSS 2.0 feed. You can leave a response, or trackback from your own site.